They buried my grandfather with a paintbrush in his shirt pocket. Painting was his passion and he loved nothing more than painting pictures of the sea and the ships that sailed across it. The walls of my grandparents’ house were littered with his oil paintings of navy vessels, historic ships, and tossing seas. If you found a nice piece of driftwood on the beach, my grandfather would paint a picture of the ocean on it complete with dolphins dancing on the surf. He painted cards that we would receive twice a year, for Christmas and our birthdays, with $25.00 tucked inside. My grandfather was a character. A tinkerer with a vivid imagination, he always swept us up in the excitement of his plans and made us believe that the impossible was possible. One summer, we spent hours building a kite big enough to send me and my brothers soaring over the beaches of St. Augustine. The kite was never completed, but its ability to send us flying was never in doubt. Another visit involved constructing a rather dangerous and rickety go-cart that crashed in a spectacular fashion the first time it was taken out for a drive. An over-the-top figure, he loved the absurd and seemed to delight in getting under people’s skin. He would steal French fries off our dinner plates (and blame a stranger’s baby for the theft) and slip $20.00 bills into our hands when my parents weren’t looking. He was ridiculous and outlandish and we loved him for that. In one memorable visit, my grandparents came to stay with us when my mother and father went to Hawaii for the week. The visit itself was a bit of disaster. My grandparents had long ago decided that they were over raising children and were happy to let my brothers and I go crazy. Both my grandparents abhor sitting still and so in exchange for letting us run wild, they managed to get us to spend one whole day of that visit cleaning my parents’ garage. As we picked up toys and swept up sawdust, my grandfather (a constant and animated complainer) cheerfully admonished me and my brothers that we had to learn that if we messed it up, we had to clean it up. Later that day, my grandfather’s motto ringing in our ears we printed out a banner with the words “mess it up, clean it up” and hung it in the garage. My grandfather loved it. These days, when I stumble across one of the 27 birthday cards my grandfather hand-painted for me, I’ll think about looking for buried treasure with the metal detector with him on the beach or the way his face would twitch in disdain when the channel would stray from conservative FOX news to liberal CNN. When I remember these stories, I smile at his crazy ways, his many talents, and his child-like spirit. I am lucky that he was my grandfather. But what does all this have to do with food? My grandfather was Polish and this meant that pierogies and kielbasa sausage graced our dinner table growing up. The distinctive blue box of Mrs. T’s pierogies was a staple in our freezer. In what has to be one of the more unusual cravings, I’d often arrive home from school, cut up a little onion, sauté it in butter, and add precisely six frozen pierogies to the mix. It was a hearty snack, but one that always made my belly happy. It also made me think about my grandfather, who in addition to adoring carbohydrates in general, delighted in a bowl of steaming pierogies as much as I did. Realizing that Mrs. T’s pierogies could hardly compare to the real (read homemade) deal, a couple of years ago I pulled out a pierogi recipe from a Martha Stewart magazine in the doctor’s office. I recently stumbled upon it in a file and decide to give it a whirl. I added salt to the dough recipe, but otherwise kept it the same. 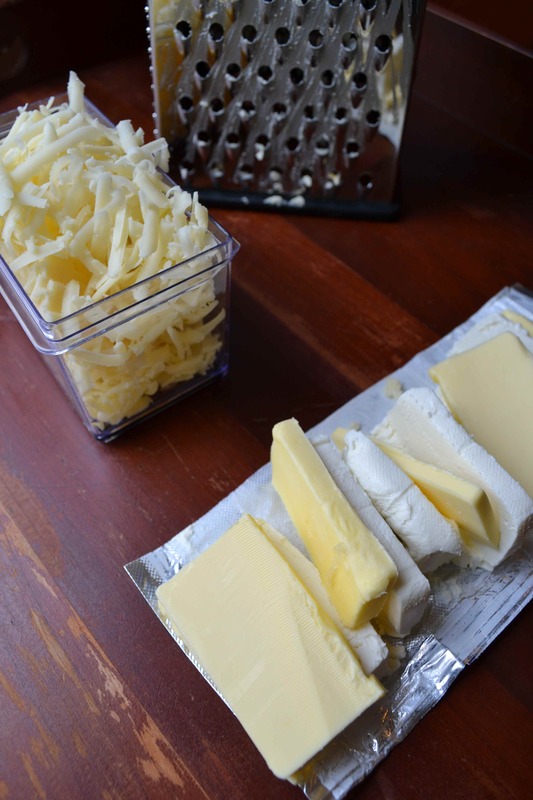 I tweaked the filling by reducing the amount of potatoes used and replacing some of the cream cheese with extra sharp cheddar cheese. The recipe calls for a brown butter sauce, but I stuck with tradition and made the same simple sauce from my youth of sautéing onions in butter. While time-consuming, the steps themselves are simple, which allows plenty of time to think about one’s grandfather and the legacy he left. Which reminds me, I’ve got a messed-up kitchen that needs cleaning. Happy cooking! 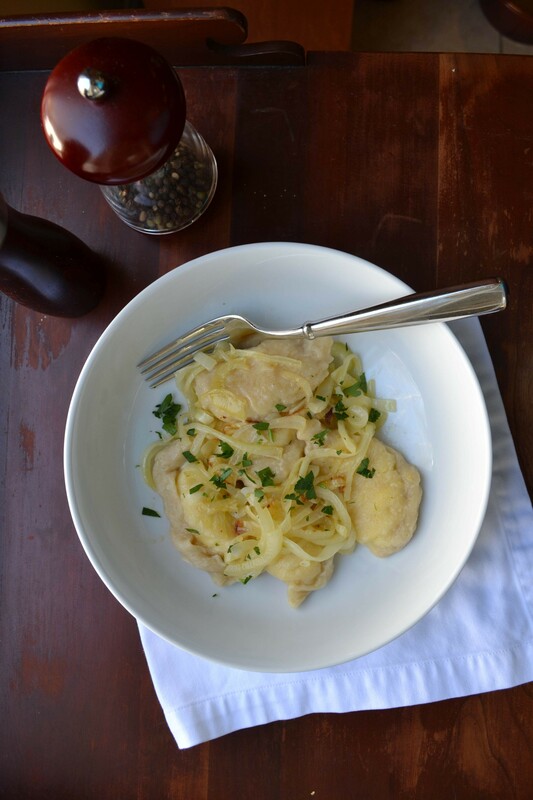 This recipe makes a ton of pierogies, but they freeze well for future meals or afternoon snacks! In a large bowl, whisk the egg and sour cream together. Add the milk, water, and salt and whisk to combine. Add the flour, one cup at a time, and stir until incorporated. The resulting dough will be shaggy and sticky. Flour a clean surface and turn the dough out on the counter. Knead the dough, dusting with flour as needed, for about 6 minutes or until the dough comes together and is smooth. Dust with flour and set aside, covered by a large, inverted bowl, for 1 hour. 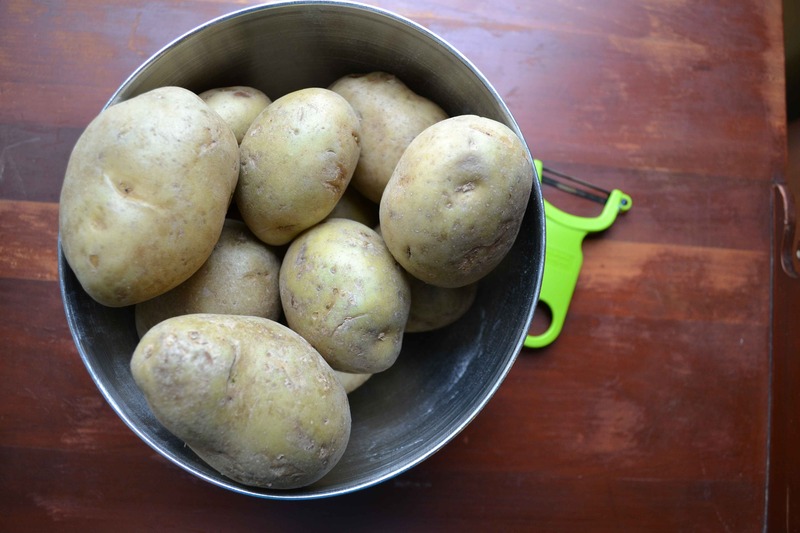 Cover the potatoes with cold water and salt the water. 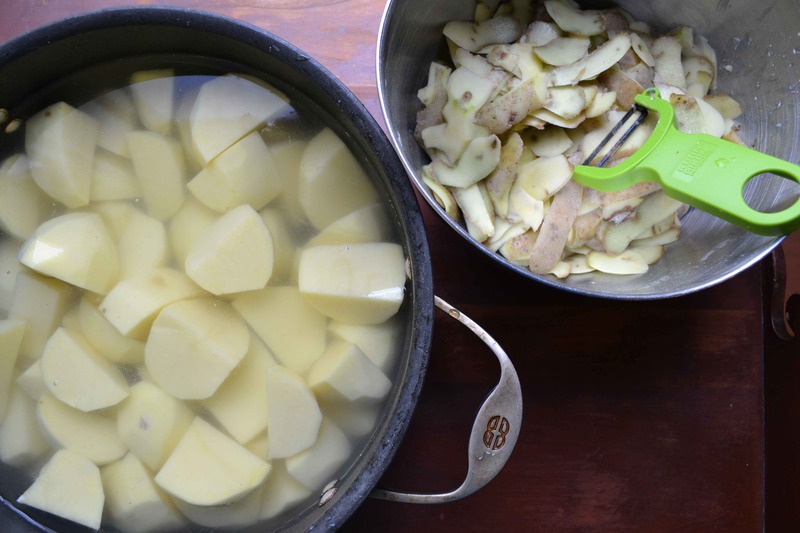 Bring to a boil and cook for 10 minutes or until the potatoes are fork tender. 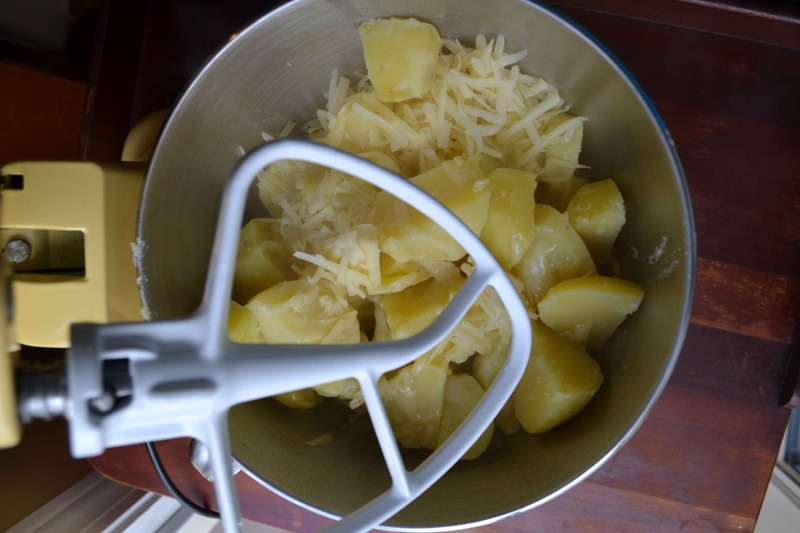 Drain the potatoes and place them in the bowl of an electric mixer with the cream cheese, cheddar cheese, and butter. Mix with a paddle attachment until the mixture is smooth and creamy. Season to taste with salt. 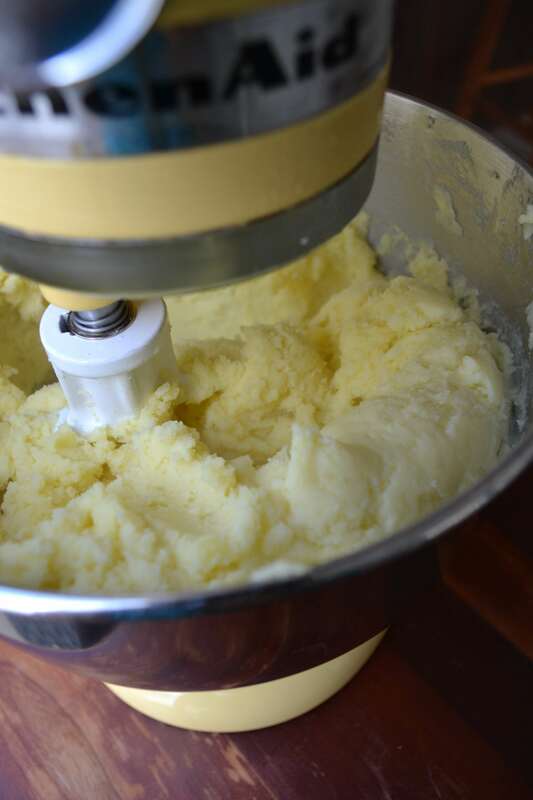 Allow the mixture to cool and then form about 60 small cylinders from golf-ball size amounts of potato filling. Place on a large baking sheet. Dust a cleared work surface with flour and place the dough atop it. 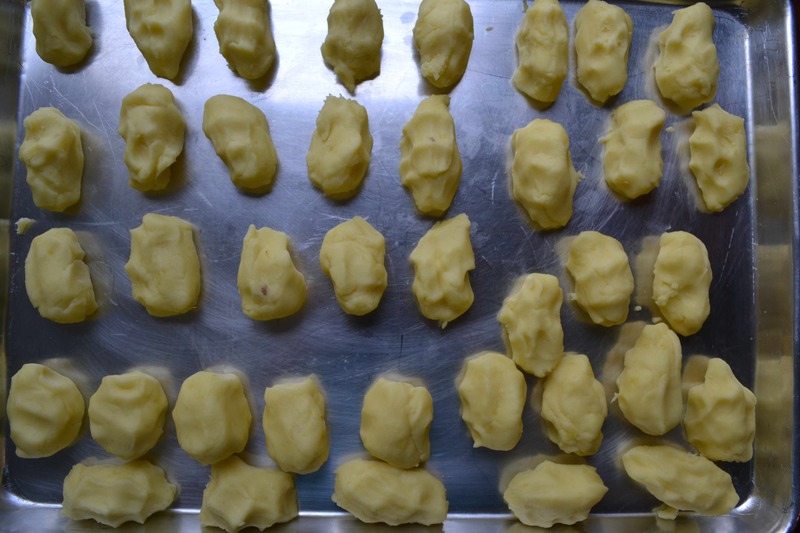 Cut the dough in 4 equal portions using a bench scraper or a sharp knife. Cover three of the portions with plastic wrap and set aside. Roll the remaining portion of dough out until it is 1/8-inch thick, dusting with flour as needed. 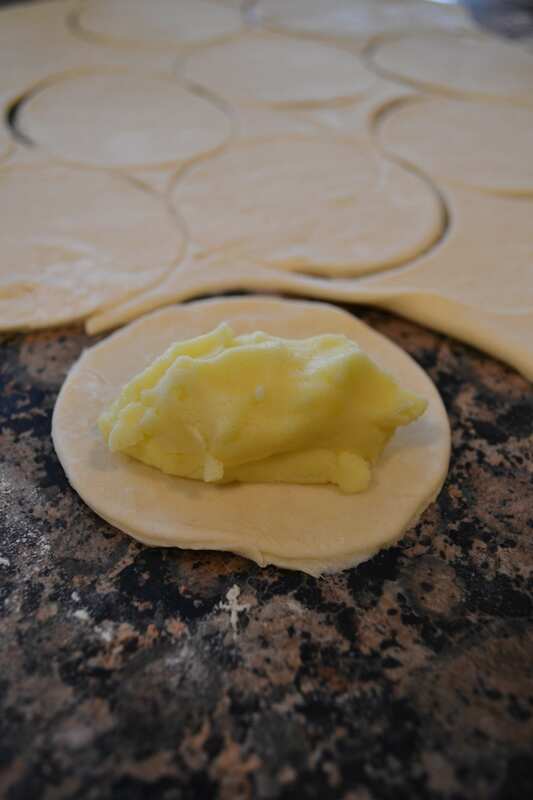 Use a 3-½ inch round cutter to cut out as many round as possible from the dough. Place a potato ball on one half of a round and use your fingers to pull the dough over the filling to form a half-circle. Dust your fingers with flour and pinch the edges of the round shut to seal. Place the formed pierogi on a parchment-lined baking sheet dusted with cornmeal. Repeat until all the pierogis have been formed. I balled up the scraps and rolled them out again in order to get 5 dozen pierogies. However, the re-rolled scraps made for a tougher dough and I would only re-roll the dough once for best results. When ready to prepare the pierogies, bring a large pot of salted water to a rolling boil. Add the pierogies in batches (you want the water to remain boiling). The pierogies will float to the top as they cook. When they reach the surface, set the timer for 2 minutes and then remove with a slotted spoon or spider. Repeat with the remaining pierogies. To freeze the pierogies, place the baking sheet of uncooked pierogies dusted with cornmeal in the freezer and freeze until solid. 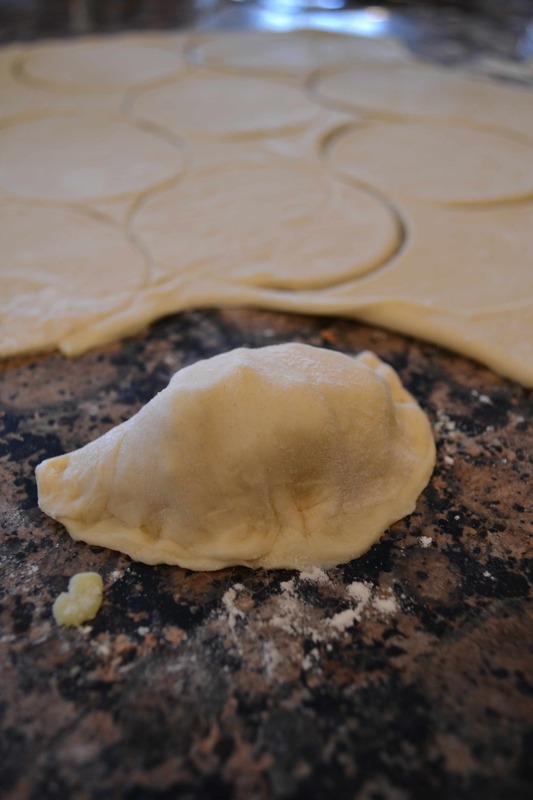 Remove the frozen pierogies and place in a freezer-safe container or freezer bag. When ready to prepare, drop the still frozen pierogies into the boiling water and simply add another 30 seconds to one minute to the cooking time after they float to the top. 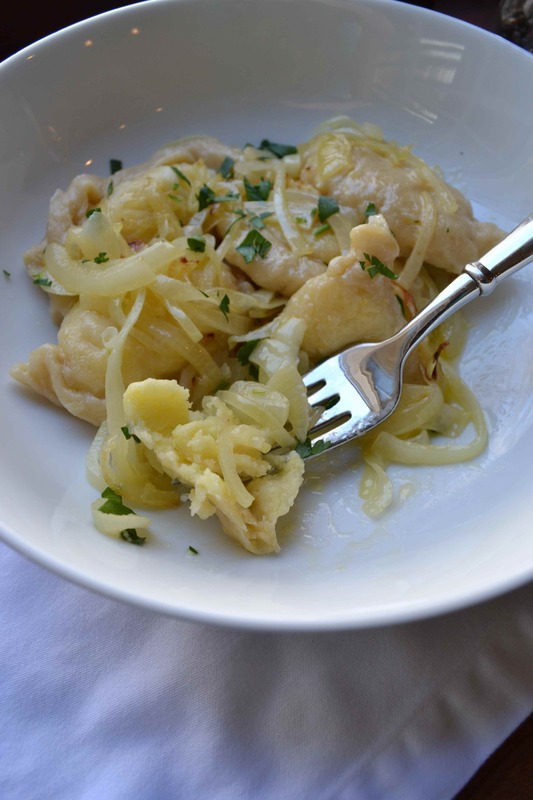 Pierogies can be served with sliced yellow onions sautéed in butter (as seen in the pictures) or may be drenched in your favorite brown butter sauce.